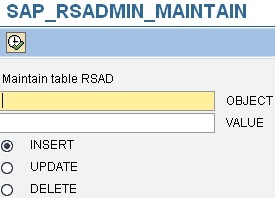 RSADMIN table is important table from BW system customizing point of view. It does contain a lot of crucial parameters which are influencing BW system. For list of all parameters of consult to note 912367 - Composite Note: RSADMIN Parameter. If you need to read parameter’s values on the fly e.g. from your routines in transformation you can use following function module: RSA2_RSADMIN_GET.